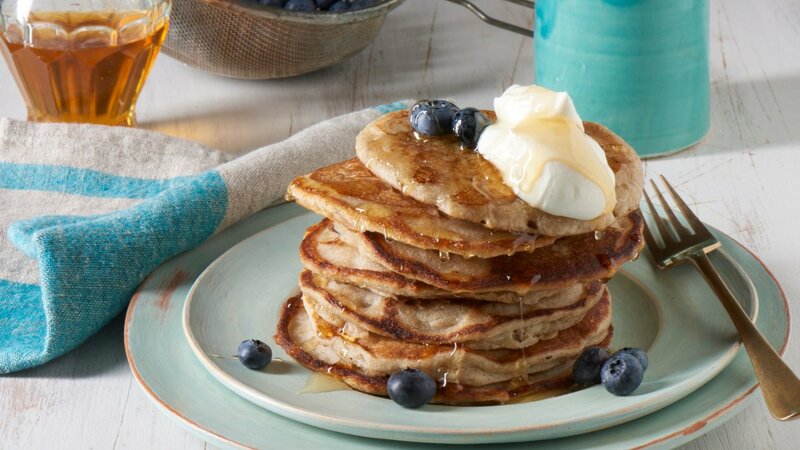 Breakfast pancakes made with bananas and buckwheat. A great gluten free alternative! Serve them with Soya or coconut yoghurt and fresh blueberries. Whisk together the buckwheat flour and bicarbonate of soda. Melt the FLORA Buttery and pour into the soya milk. Whisk the bananas then add in the buckwheat mixture. Slowly add the soya milk until a smooth batter is formed. Pre-heat a large frying pan over a medium heat for 3-5 minutes. Add in some sunflower oil into the frying pan, let it heat for a minute, then add the batter a to the desired size. Cook for about 2 minutes on each side serve warm withsoya yoghurt and fresh blueberries.